For the fifth year we’re excited to announce our Most Popular Diets of 2019 list! And it’s a good one! While Weight Watchers gave up the number one position in 2019 for the first time in our history, they reclaimed the top spot this year earning them the title of Most Popular Diet of 2019. As they are weeks away from celebrating their 50th anniversary, they announced Weight Watchers 360 to help people establish healthy, lasting habits right at the new year. In a sort of diet tag, 17 Day Diet moved to number two, a more than respectable position for a series of weight loss books that has been hard at work since its debut in late 2019. This year 17 Day Diet expanded its value to its loyal followers with the publication of a cookbook and an anti-aging plan. One of only two brands that makes multiple appearances on the list, 17 Day Diet’s Meal Plan, facilitated by Bistro MD, landed at number 24 (down from number 3 in 2019). For the first time in our list’s five-year history, acai doesn’t show up. It seems the heyday for this diet pill has run its course, but hasn’t taken the entire supplement industry down with it. Dr. Oz’s hyped promotion of raspberry ketones landed it at number 19 on the list, no doubt stealing a lot of thunder from acai. Jillian Michaels is the only other brand that makes multiple appearances on our list, as she does every year. Her nearly five-year-old workout DVD 30 Day Shred took position 8, an improvement over last year’s number 10 ranking. Right after that is her Detox and Cleanse product, and anchoring the list at number 20, down from number 4 in 2019, is her Jillian Michaels Online subscription program. Her exit from both Biggest Loser and The Doctors in the past 18 months may have caused a slight decline, but her popularity is rarely wavering. In fact, America’s Toughest Trainer returns to NBC’s Biggest Loser for season 14 in January. We expect to see her on the list again next year. 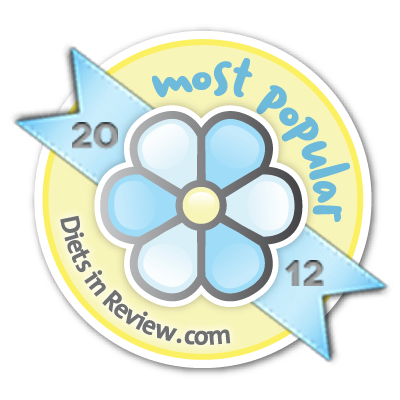 DASH Diet made an impressive entrance on to the list at number 12. The heart and diabetes associations have both long endorsed this balanced eating plan, but a nod from US News and World Reports as the Best Diet of 2019 back in January gave it a surge of primetime popularity. Honorable Mentions this year go to Diet To Go, a healthful meal delivery program that has ranked in years past but fell out of the top 25 in 2019. As well, the caveman or Paleo Diet gets a mention due to its wild popularity this year as more products, authors, and programs supported this unique style of eating. Supreme 90 gets a mention, as it held position 20 in 2019. Its competitor P90X, with an intense following all its own, hasn’t made the list since 2019. CLICK HERE to view the Most Popular Diets of 2019 list in its entirety and learn more about each of the top 25 programs. 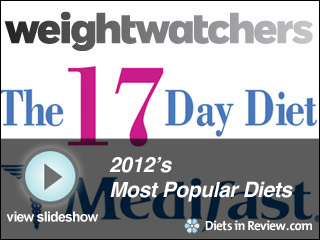 *All rankings determined by traffic to each diet review page on DietsInReview.com 1/1/12 – 12/1/12.